Over the course of the last 10 weeks, I’ve learned to debone and break down a chicken, glove bone a Cornish hen, fillet flat and round fish, pan sear duck (nearly to perfection! ); I’ve made each of the five mother sauces, I’ve honed my knife skills (although, I don’t think tourneed potatoes will be making a regular appearance in my kitchen), made a variety of stocks and soups, and I’ve learned lots of industry secrets that I will keep to myself. I cannot call myself a vegetarian anymore. I’ve made (and enjoyed) many dishes that are non-vegetarian. I will take the next 6 months as a hiatus from this dietary preference and decide what to do when I’m done with the program. When I go to a restaurant now, I study the menu a little more closely, not just for its contents but also for the placement of the items they’re selling. There is a whole science behind menu layouts and how they are read by the end user. Using this research, restaurants often know to place the $45.00 item in proximity to other items with a lower cost that they really want to sell, so they look cheaper by comparison. It’s actually pretty fascinating stuff – you can read up on one popular study that breaks down the famous New York restaurant Balthazar’s menu. As I’m sitting here this Saturday I’m both happy to have a break but bummed to not be going to class on Monday. This quarter ended at a perfect time though – right before the holiday season. With lots of parties and time off, I am looking forward to more opportunities to practice what I’ve learned. Thanks to all of you who humor me and listen while I ramble on about how such and such dish turned out when probably a simple “great” was all you were looking for. Thanks to all of my friends and family who continue to support me in the endeavor – it makes it so much more rewarding! 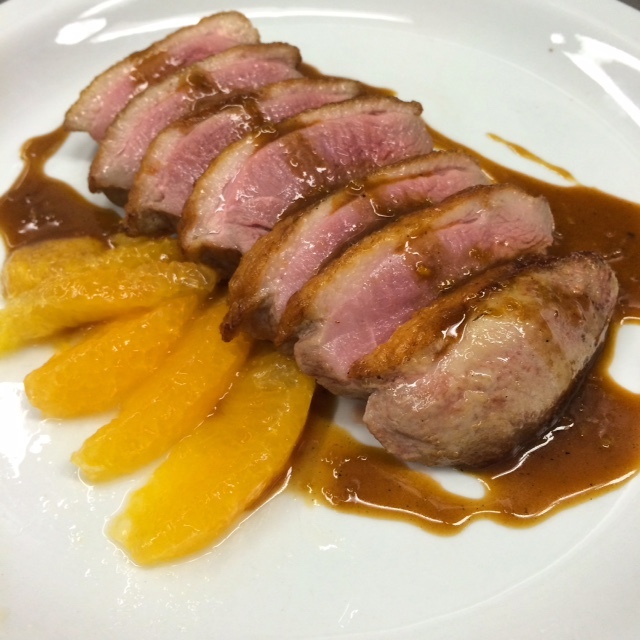 Duck a l’orange – oooh la la!